If you’re looking into getting braces, you may be intimidated by all of the orthodontic jargon. When it comes to your treatment, there’s a variety of terms and phrases used to explain the treatment process and it definitely helps to understand their meanings. At Ortega Orthodontics, we want you to feel comfortable throughout your entire treatment process, so we’ll make sure to explain every step along the way. Appliances: Any device that is designed to move the teeth, align the jaw, or keep teeth in place after treatment. Archwire: The metal wire that is attached to brackets and helps move the teeth. Band: The metal ring that is cemented to the teeth for anchorage. Bond: The seal from orthodontic cement that holds appliances in place. Braces: The common term for orthodontic appliances that usually consist of braces, wires, and bands. Bracket: The metal pieces directly bonded to the teeth that hold the archwire in place. Bruxism: Grinding of the teeth, usually at night that may lead to tooth wear and jaw pain. Crossbite: A lateral misalignment of the arches where your upper teeth fall inside the lower teeth on one side or the top front teeth fall behind the lower front teeth. 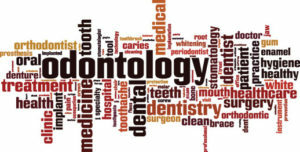 DDS or DMD: A Doctor of Dental Surgery or a Doctor of Dental Medicine. Eruption: The process of teeth entering the mouth. Elastics: Small rubber bands that may be used during treatment to provide individual tooth movement or further jaw alignment. Fixed Appliances: An orthodontic appliance that is bonded to the teeth and cannot be removed by the patient. Headgear: An appliance worn outside the mouth that helps with traction for growth modification and tooth movement. Malocclusion: The term used to describe a misaligned bite or teeth that do not fit together properly. Mouthguard: A removable device used to protect the teeth during sporting activities, this is especially important for orthodontic patients. Nightguard: A removable appliance worn at night to help minimize the damage from clenching or grinding the teeth while sleeping. Open Bite: A type of malocclusion where the teeth do not make contact with each other. Periodontal: Refers to the hard and soft supporting structures around the teeth. Plaque: A colorless film of bacteria that constantly forms in the mouth and threatens the health of teeth and gums by causing tooth decay and gum disease. Removable Appliance: An appliance that can be removed by the patient and is used to move teeth, align the jaw, or keep teeth in place following treatment, such as a retainer. Retainer: A fixed or removable appliance that is worn after braces are removed to keep teeth in their finished positions. Separators: An elastic ring or small wire loop that is placed in between the teeth about a week prior to the bands being cemented to create space for the placement of bands. Wax: Wax can be placed on brackets or wires to help minimize discomfort to the cheeks or lips. Wires: Also known as archwires, wires are held in the brackets and are used to move the teeth. Traditional Braces: This treatment option is both affordable and effective and consists of traditional brackets and metal wires. Clear Braces: Clear braces are similar to traditional braces, however the brackets are clear to blend in better with your teeth. Invisalign: Using virtually invisible plastic aligner trays, Invisalign helps to straighten teeth comfortably and easily. Lingual Braces: This method places the brackets on the inside or back of the teeth for discreet and effective treatment. To learn more about your treatment options or to better understand the treatment process, contact the team at Ortega Orthodontics today!